It’s curious how the mind can become compartmentalised when you’re really busy. 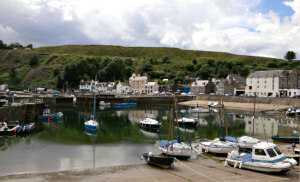 Earlier this week I was up in the north-east of Scotland visiting a new client near Stonehaven. Now I’ve been to most parts of the Scottish mainland but this is an area that’s had little attention; I think I’ve been to Aberdeen four or five times at most and as far as I can recall I don’t think I’ve been to the coastal section from Arbroath to Stonehaven before at all. Yet as a landscape photographer I’ve been meaning to go and photograph Dunnottar Castle for many years – it’s a spectacular sight and it’s mentioned briefly in Dorothy Dunnett’s Ringed Castle so I’d intended to add it to the places to visit feature on the Dunnett website. Yet consciously I didn’t tie in the business trip with any thoughts of Dunnottar until after the meeting had taken place and I was thinking about heading home. And of course with my mind on business I hadn’t taken my SLR along with me, despite my subconscious hinting to me that I should. 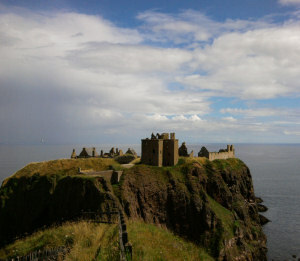 It knew that Dunnottar was nearby while my conscious brain was busy ignoring it. 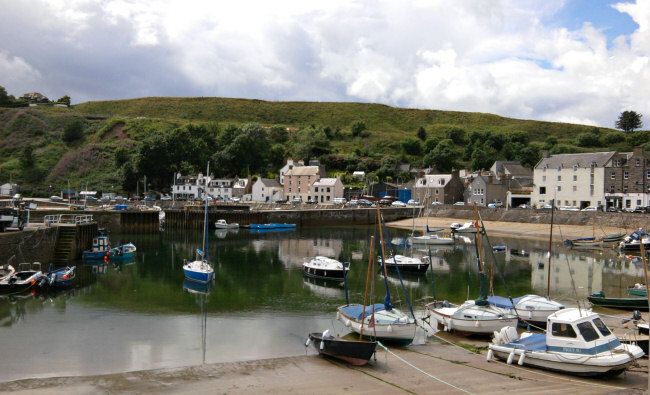 It was raining heavily as I left the meeting and drove down to Stonehaven harbour but it cleared up after a short time giving a hot sun with clear blue skies and bubbling white clouds. The harbour area is picturesque and delightfully peaceful and I could have happily spent the day there. In fact under normal circumstances I would have take the 1½ mile walk from there round the coast to the castle, but being dressed for business made that inappropriate. Instead I pottered around and tried taking a few photos with my new mobile phone, a Samsung Apollo. I had no great expectations of it as I hadn’t included camera quality on the list of desirable attributes when it was chosen. In the bright sunshine I could hardly see anything on the reflective screen so the composition was pretty much guesswork, but I reckoned that at least it would be a reminder to take the real camera next time. I then drove round to Dunnottar and although again I felt overdressed for a full visit I took a quick walk down to the viewpoint and took a few more snaps. To my surprise the pictures are much better quality that I’d expected, and while it’s never going to challenge the Nikon D80 it’s nice to know that there’s a reasonable alternative when it’s just not possible to have the big camera with me. Here’s a couple of the pics as examples – click for larger version. The originals are 2048 x 1536 which is a pretty useful size.